Transferring large files from one computer to another is often difficult, due to size restrictions of the transfer medium. For example, email services typically limit attachment sizes, and an external device such as a USB drive or CD-RW may not be large enough to contain the entire file. File Splitter Lite is a small, fast, and free program which allows you to split a copy of a large file into smaller segments. You may then easily transfer the segments to another computer and use File Splitter Lite or a self-joining batch script to reconstruct the original file. 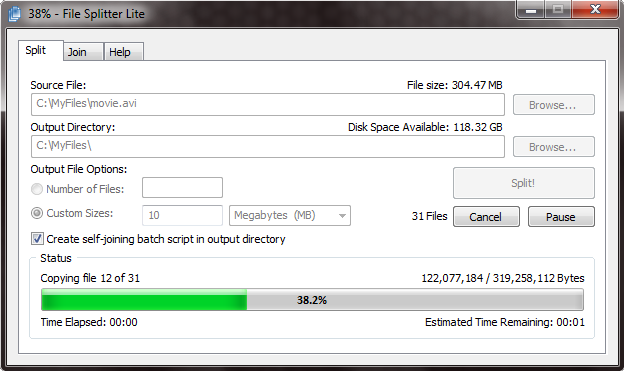 Visit the File Splitter Lite download page. Optionally create a batch script for automatic joining, without the need to run File Splitter Lite on the destination computer.